So I had to look back into the previous season to confirm whether or not Kumiko was the character through which we followed the entire story. I know it sounds silly, she is the main character after all, but for some reason I felt the show was a little more open in terms of perspectives than what has been shown in the current season so far. From what I found, season one definitely follows Kumiko, at least in the beginning. Later on we get to see more points of view and scenes with other characters where Kumiko is not present. The reason I bring this up is because in the current season I feel like we’re may be following her a little too much. Right now, it’s through her that we find the viewpoints of the others, and it feels like Kumiko just happens to be in that position to inform the audience. I love the relationship between Reina and Kumiko, and one reason for that is because through that bond we have learned so much more about Reina. Before that friendship formed, Reina was a very distant character with not a lot going on for her other than her being a perfectionist. It was through Kumiko that we were able to see another side of Reina in the first place, taking notice of her actions outside of the classroom and seeing her truly express herself. Consequentially, we are given a very strong feeling as to the relationship between these two all because of how much we are able to learn about Reina, and the more we learn about Reina the greater we’ll be able to infer their friendship is. But if we take this approach for other characters, I start to wonder if it’ll feel like Kumiko is overextending. Is she going to be the one to get the core of Asuka, Mizore, and Nozomi? And how will this affect Reina? She’s already questioning why Kumiko’s been sneaking out, and I’d hate to be distanced from Reina again as she’s such an amazing character, but that of course is just a personal desire. So far in this season, Kumiko has been actively gathering information from the others. First by sheer coincidence, but now she is definitely starting to be driven by curiosity and a genuine desire to help Nozomi. And so Kumiko finally gets an answer as to why Asuka will not allow Nozomi to rejoin. The thing about this answer is, we already kind of knew it. Mizore has been having troubles ever since Nozomi’s return, due to some sort of trauma from the previous band club they were in together. What we didn’t know however, was that Asuka knew about it. What really awesome, and maybe even a little disconcerting, about this exchange between Asuka and Kumiko is that Asuka is definitely insinuated to be a cold, remorseless person under that joyous and comedic exterior. This is made clear more overtly through her own actions than anyone else. She subtly inserts very serious remarks into her casual way of speaking, and she sort of aggrandizes the dark secret of why she doesn’t accept Nozomi by saying things like “Why do you want to know?” and “It’ll haunt you later”. And then after Asuka reveals the secret she says something incredibly striking: “Even I’m not that much of a monster”. She says it in response to why she doesn’t want to put Mizore through the pain that Nozomi’s presence would cause, and it’s brilliant because it’s almost like a form of irony. Asuka is playing right along with the story and our expectation of her, and yet because of the way she casually says everything there’s still room for doubt. I am really interested in seeing if or how Kumiko breaks into Asuka’s shell and finds out who she really is on the inside. It’s mainly the Nozomi and Mizore plot that worries me in the way that Kumiko might be being pulled in too many directions. Character drama aside, two major themes really come to the forefront this episode (although one of them was already brought up last episode). The worth competition and putting emotion into your music are just two major topics that actually come across through dialogue. 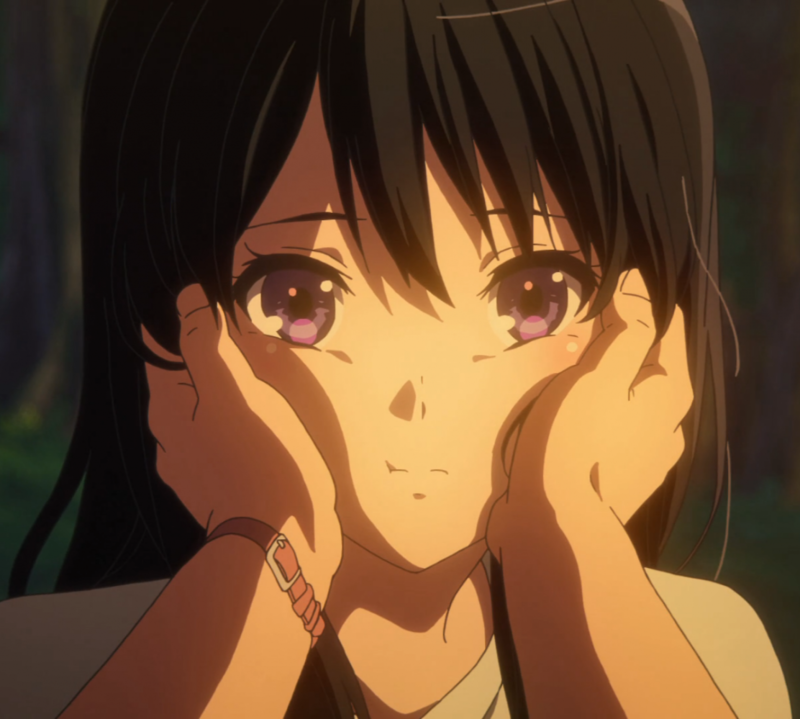 Firstly, Kumiko learned that Mizore hates competition, and so with that in her head she decides to ask others what they’re thoughts are on it. Reina of course finds value in them, whereas some of the others are more in the middle. They all would like to be the best, but is it really worth letting a panel of judges define your worth? Who’s to say really, it’s all completely subjective. Yet the pursuit of a prestigious goal is still worth the effort and helps make you stronger. The point is, there’s a lot of different ways to look at competitions, and so it’ll be exciting when Kumiko comes up with her own answer. Then the putting your emotion into your music, a theme that is brought on by the new sensei’s observations and comments. Hashimoto-sensei is bringing attention to the expression of music, and how students like Reina and Mizore can play perfectly but still be missing the personal flare that can make their performance truly memorable. Because of these wise words, we’re probably going to see some character’s trying to find their own sort of style and put the essence of themselves into the music they play. It was good advice, but to be honest, I didn’t really feel Hashimoto needed to be the one to say them. In fact, before this episode I started to believe Hashimoto-sensei might be a bit of a superfluous addition to the cast. That is until he had a little chat with Kumiko in this episode, and that’s where I saw at least one useful role he could fill. Hashimoto was, and still is, a good friend of Taki-sensei. He knows a lot about him, and through the short talk he had with Kumiko alone we found out that Taki-sensei had a wife that passed away. I do hope to see him have something of his own that Taki-sensei can’t do himself in terms of teaching the band, but for now at least he can give us delicious insights into what’s going on with Taki-sensei. All in all, I’m pretty happy with how this season’s going so far. Each episode leaves me wanting more, and I can’t stop adoring Kumiko and Reina together. A couple of strong themes have been planted into the show, and the seeds of drama are already starting to sprout. It’ll be exciting to see where this all goes, and also incredibly sad because it’ll only bring us closer to the end.